Safety of kids in the playground has always been the matter of concern for the parents. Do you also get worried about your children while they are playing outside? Here are certain things you must check in the playground to be sure of your kids' safety. There are different types of playground equipment made of plastic, wood and metal installed in the park. Before you allow your children to play on any of the play sets, ensure that it is made of guidelines defined by International Playground Equipment Manufacturers Association (IPEMA) and American Society for Testing and Materials (ASTM). Consider there should not be any rough surface or pointy edges in the equipment that can severely harm the kids. 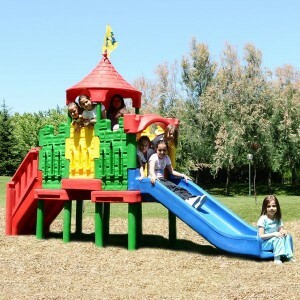 The surface under and around the playground equipment should be covered with finest quality mulch like rubber mulch, pea gravel, engineered wood fiber wooden mulch and rubber mats. These provide proper cushioning to the surface and prevent the injuries from falls. Therefore, you should ensure the playground in which you are take the kids must be installed with superior quality mulch. Do not allow your kids to get dressed in loose outfits for the playground. New York State Department of Health has also advised that these outfits should be strictly prohibited in the park as these can get stuck in metal, wood or plastic playground equipment and may cause injury to children. Also, make your kids wear sneakers with rubber soles instead of sandals or flip-flops in the playground. Why Install Recycled Rubber Mulch in Playground?